Capacities: 700 lbs & 2000 lbs to 16 ft.
Superlift's ToolMan is an innovative new product for the Contractor, Rental, Industrial and Institutional user and offers flexibility like no other piece of equipment in the market place today. 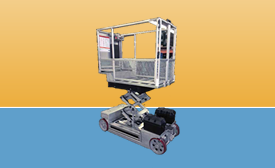 Capacities: 700 lbs & 2000 lbs to 19 ft.
With dual capacities of 700 lbs and 2,000 lbs, this heavy duty self propelled manlift/material lift is the most complete lift product available. It's center scissor arms and stabilizer support arms are perfect for holding valves on cylinders. 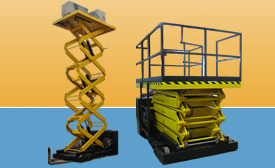 Capacities: Up to 10,000 lbs to 35 ft.
Superlift Material Handling Inc, a provider of custom lifting devices, has entered the manlift market with custom lifts as well as the Goliath which expands the usefulness of the scissor lift in the contractor and rental markets. 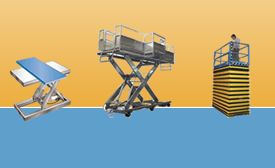 Capacities: to 10,000 lbs and 35 ft.
Hurculift offers a full product line of stationary lifts for men and material with lift heights to 35 feet and in configurations to fit any lifting requirement. 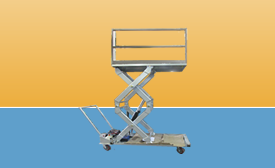 Capacities: to 10,000 lbs and 14 ft.
Our stainless steel lifts can handle capacities from 500 lbs to 10,000 lbs and lift heights to 144", helping to increase productivity, eliminate injuries and cleaner facilities. 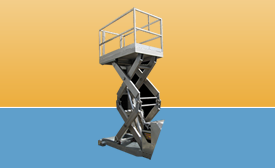 Capacities: to 3500 lbs to 35 ft.
Superlift Material Handling Inc. provides engineered solutions to your personnel lifting issues. 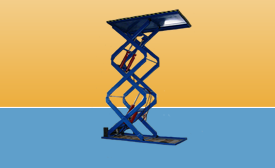 We will provide a solution that will eliminate ergonomic and safety issues.